The best day in high school Spanish class was “La Catrina” day. Profe would stockpile those episodes freshman year until she had absolutely no willpower against nearly 30 teenagers with made-up Spanish names (and the popular girls fighting over who got to be Margarita this year). Videos and songs brought Hispanic culture and language to life for me (and MI BISABUELA was our comeback for all of high school). As a language teacher myself, I’ve found that my students tend to engage whenever technology is involved – no overhead projectors in Spanish classrooms! Anything related to videos and listening has their ears perked up, and I’m always impressed when my FCE students tell me they’ve watched a program in English or translated songs and picked up a few new words. Before coming to Spain, I checked out loads of books in Spanish, as well as films, to up my español game. Now that online learning has become so big, there are loads of cool ways to brush up while sitting at your computer. I recently tried a new Beta version of FluentU, a wildly successful company whose video training in Mandarin Chinese is now tackling the world’s second most spoken language. Using authentic videos, audio scripts and flashcards, FluentU tracks your progress and suits all levels of language learning. From novato to native: Right off the bat, FluentU asks you what level you are, giving a sound description of what your language abilities are at each level. I chose Native since I’ve already got a C1 DELE degree, and the software recommended word lists and videos suited for advanced learners. Videos for every taste: FluentU has videos about everything and anything – from politics to culture to human interest stories and songs. 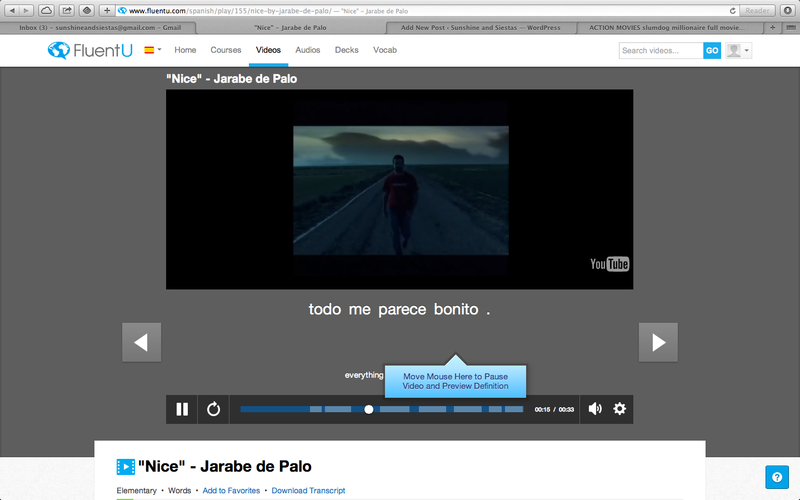 When I checked out some of the videos at lower levels, it was clear which grammar and tense concepts they were drilling – I loved that there was even a Jarabe de Palo song to teach the usage of the adjective ‘bonito’! 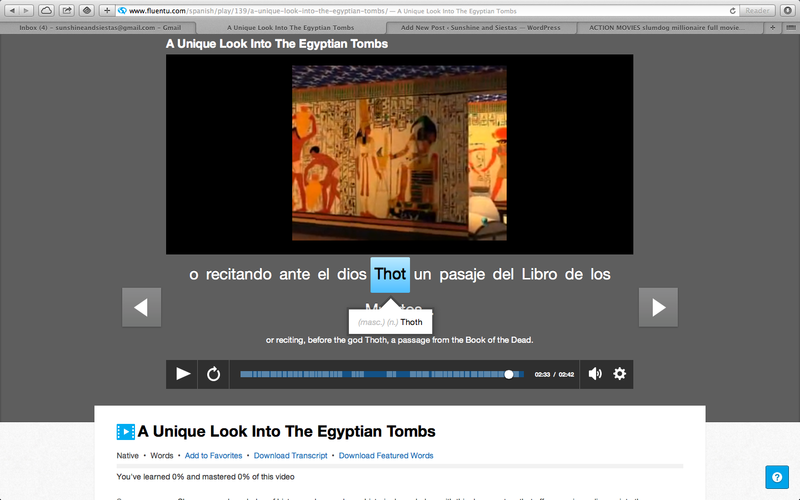 Manageable chunks according to level: The videos were an appropriate length for level, and you can hover over the subtitles under the video to see the definition and pronunciation for each word. The video stops, so you won’t miss anything. Tracking progress: Language learning builds upon prior knowledge, so the FluentU software tells you how much of a video you should be able to understand, based on videos and word lists you’ve already done. There are also quizzes and you can create your own study lists, making it easy to see how far you’ve come. Native level: Not to fanfarronear or anything, but apparently my Spanish is considered native level already. I didn’t run across any unknown words, but chalk that up to the focus being for newbies. 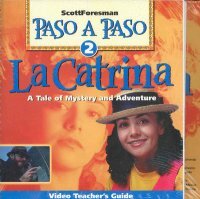 There was also a lack of the Castellano accent in upper levels: Most of the videos in the upper levels are reserved for a South American accent, and I didn’t hear any from Spain. There were a few at lower levels, however. Speaking is absent: Speaking is one of the most important language skills (and often the hardest to master), and this sort of learning doesn’t lend well to strengthening them. Your vocabulary and listening skills will probably grow, but you’ll need to practice oral expression another way. Want to try it for yourself? 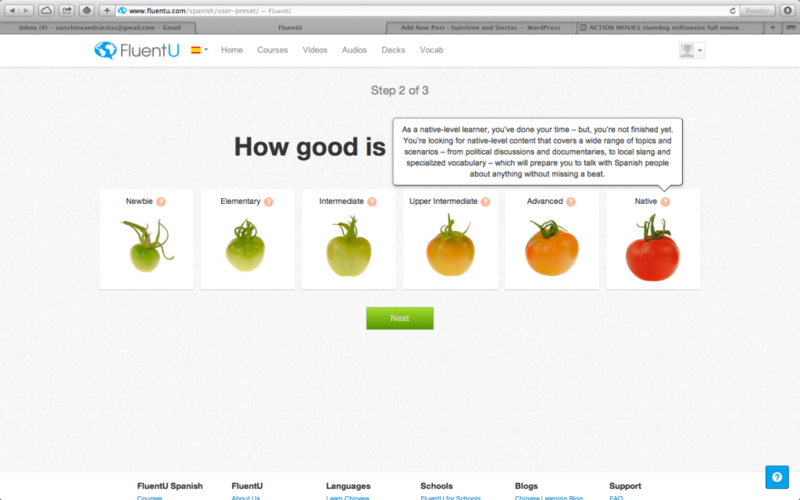 FluentU is offering 30 SandS readers the chance to test drive their new Spanish version for free! If you’ll be coming to Spain for the language assistants program, this is an awesome way to brush up on your listening skills and learn a few phrases before jetting to Spain. You just need to provide your email address! You’ll have until April 25th to sign up, using the rafflecopter widget below, and leaving a blog post comment. How did you learn Spanish? Would you like online learning? 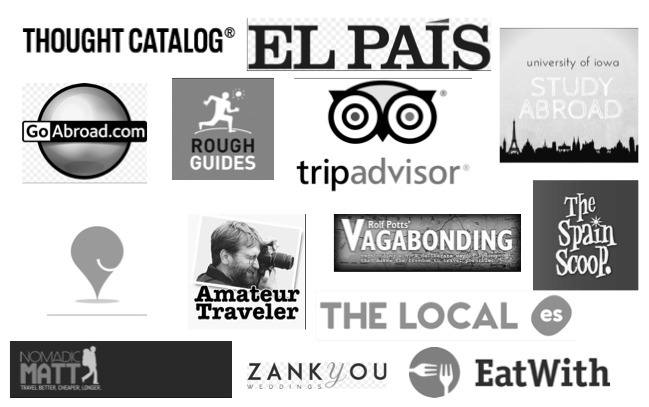 If you’re looking to learn Spanish in Seville, Madrid or Barcelona, get in touch! FluentU allowed me to use their software for free for two weeks, but todas las opiniones son mine. I would love to give it a try. I need to practice my listening skills. Have got you signed up! Definitely sounds interesting…heading to Guatemala later this year and would like to sharpen my Spanish through FluentU! Got you signed up, Rich! Guatemala looks amazing – que te diviertas! I would love this! I’m always trying to better the few languages I have tried to learn…this sound like a good way to listen. Would love to try! Thanks Cat. Would like to give it a shot, please! I would love to give this a try! Going to Spain this upcoming October for the language assistant program! This sounds like a great program to help with learning Spanish! I’m looking forward to using it before I move to Spain! Heya. Definitely keen to try this before heading to Spain. Cheers! You’re on the list, Stefan! Would love to work on my Spanish fluency for my upcoming year in Spain! Hola Andrea, you’re noted down, as is your blog! I would love to give this a try! Thanks!! My pleasure – look for an email soon! I’d love to give this a try! Sign me up, please! Happy to! Have you had a chance to check out any of the book recs I sent? I’m moving to Spain in the fall and I would love to try this! Your blog is great by the way- it’s been a big help! Why thank you! Let me know if I can help out in any other way as your prepare for Spain! I’m currently living in Madrid as an auxiliar, so I’d be interested to see what my level is at this point! Sure! I’ve got you signed up, Lisa. Hope you’re (finally) enjoying the Spring! I find the GUI confusing. I can’t figure out how to go through the vidoes. I only was able to navigate a little by writing an e-mail to FluentU, which was promplty anwered. I might try again, but for now I’ll go back to other alternatives. By the way, contrary to what what the reviewer adndso many people write, not all students go gaga over high tech. While my students like the ease of Powerpoint, generally only my IT majors really get into high tech stuff. While the others don’t seem to be aware of library reference books, they are not happy with very many of the hgi-tech activbities at our colelge and one sthat I’ve offered. They tend to prefer colorful paperback text- and workbooks and actual real-poeple activities (e.g., skits). These are Korean college kids. Intresting observation, Kim! My kids go gaga over anything that isn’t their book!